With nearly 300 in attendance, families, friends and alumni filled the Barbieri student center on Monday January 29th. The night began with time to socialize and reconnect while everyone gathered. A delicious Italian buffet was served as the guest sat to enjoy of night of presentations and stories. The blue & white pride could be felt in the air as tales of youth, adult accomplishments and continuing legacies were shared over the next two hours. Many individuals were thanked and all were reminded just how much an education from Gonzaga Prep in the Jesuit tradition is unique and transformative. Please return to this page in the coming weeks to view video of the presentations and acceptance speeches of the inductees. John Manix `79 to present inductee: Jack Stockton † `45 and his son, Steve Stockton `76 received the award on his behalf. Living all his life in the Gonzaga University District, Jack has always bled blue and white. An alumnus and President of the class of 1945, Jack would go on to be a successful businessman, loving husband, and proud father and grandfather. He was a founding member of the Gonzaga Prep Booster Club, and named Alumni of the Year in 1976. For over 40 years, you could also find him behind the bar at Jack & Dan’s. He and his wife Clemy sent their four children through Prep, and had numerous grandchildren attend. He was an iconic fixture at all Gonzaga Prep football and basketball games, as well as a legendary member of the St. Aloysius, Gonzaga Prep, and Gonzaga University communities. An alumnus from the class of 1963, Ginge lettered in football, basketball, track and baseball, and was involved in many clubs and activities. He was an All-State and All-City performer, was named the Spokane Chronicle Player of the Year, and held several city records in football. After graduation, he attended the University of Washington, where he played football, earned a degree in Personnel & Industrial Relations, and was commissioned as an officer in the U.S. Army. After serving in Korea, he and childhood friend Tim Welsh purchased Garco Building Systems, for which he worked, and turned it into what is now Garco Construction. 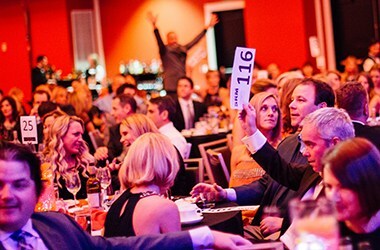 Ginge and his wife Patsy are co-founders of the Reach for the Future college tuition assistance program, and are the proud parents of two Gonzaga Prep alumnae: Alison`89 and Ashley`93. Tim Welsh `63 presenting inductee: John Luger `64. A member of the class of 1964, John was an accomplished student athlete. He was a captain on the ’63 State Champion football team, as well as an honorary captain for the All-City and All-State football teams, and received the Father Curtis Sharp Award at graduation. John went on to play football at the University of Oregon and graduated with a degree in Marketing, and was commissioned in the U.S. Army where he served his country while stationed in Korea. A successful businessman and philanthropist, John and his wife Donna founded Data Base, Inc., the nation’s largest privately owned data-storage company. 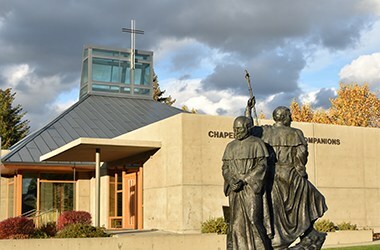 True to their Jesuit roots, John and Donna have always championed Catholic education and that was most evident in John’s leadership and passion to create the current campus for Eastside Catholic School in Sammamish, WA. In 2002, John received the Archbishop’s Award for Leadership in recognition of his work with Eastside Catholic, St. Louise School, and support of the Fulcrum Foundation in Seattle. In 2009, he was awarded the National Catholic Education Association’s highest honor, the St. Elizabeth Ann Seton Award given in recognition of his significant philanthropic and leadership contributions. 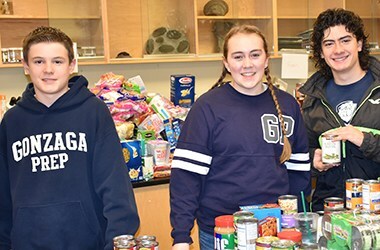 John’s leadership and support of Gonzaga University, Gonzaga Preparatory School, St. Aloysius Gonzaga Catholic School and Nazareth Guild continues to directly impact education in Spokane. Dan McCanna `83 presented inductee: Mark Machtolf `83. Mark was an exceptional athlete at Gonzaga Prep. He was a three-year letterman in baseball, basketball, and football, and received first team All-City honors in all three sports. As a senior, he was named first team All-State and helped lead the Bullpups football team to a state championship victory in the 1982 Kingbowl game. After graduating in 1983, he earned a football scholarship to Stanford and became a four-year baseball and two-year football letterman. Machtolf played on the Cardinal team that won the 1987 College World Series and was selected to the All-Tournament team as a designated hitter. Mark returned to Spokane with a degree in history and later received a Master’s in Education from Whitworth. He taught and coached at Gonzaga Prep, and was an assistant with the Gonzaga University baseball staff for 13 years prior to being named head coach at GU in 2003. Mark is a threetime West Coast Conference Coach of the Year, and 38 of his players have been selected in the MLB draft, including two first-round picks. Machtolf was an assistant coach in 2006 for the USA Baseball team that experienced unprecedented success, posting a 28-2-1 record and going undefeated at the World Championships in Havana, Cuba. He was also instrumental in the construction of GU’s state-of-theart baseball facility which opened at the start of the 2007 season. Mark and his wife Sheila are the proud parents of three Gonzaga Prep alumni: David`12, Steven`14 and Jack`16. Pat Shine `90 and Pat Redmond `89 presenting his twin brother, inductee: Mike Redmond `89. Mike was an outstanding baseball player at Gonzaga Prep. After graduating in 1989, he went on to play at Gonzaga University, where he was a Pac-10 first team all conference selection in 1991 and 1992. He was signed by the Florida Marlins in 1992 and developed through six minor league seasons before making his Major League Baseball debut on May 31, 1998. In 1999 he received the Marlins Charlie Hough Good Guy Award and was a member of the World Series Championship team in 2003. He played 13 seasons in the majors with three different clubs including the Marlins, Minnesota Twins, and Cleveland Indians and holds the career record for most consecutive games played (253) by a catcher without an error. He was given the Heart and Hustle Award with the Twins in 2008, and after a one-year contract with Cleveland retired on Oct 4, 2010. Redmond started his managerial career with the Toronto Blue Jays Class-A affiliate the Lansing Lugnuts where he was named the 2011 Midwest League Manager of the Year. The following season he moved up to successfully manage the Dunedin Blue Jays, and in November 2012 the Miami Marlins hired him as Manager. In 2016 Redmond was named the bench coach for the Colorado Rockies. Mike and his wife Michele have continued to reside in Spokane, WA throughout his career in Major League Baseball, and are the proud parents of two Gonzaga Prep students: Ryan`19 and Michael`21. Shari Manikowski `84, Gonzaga Prep teacher presented inductee: Major Anne McClain `97, and after a taped acceptance speech from Anne all the way from Russia, Charlotte Lamp, Anne's mother spoke on her behalf and accepted the award. While at Gonzaga Prep, Anne was actively involved in Ancilla, National Honor Society, soccer and softball. After graduating in 1997, she was awarded an appointment at the U.S. Military Academy at West Point, where she majored in Mechanical/Aeronautical Engineering and was commissioned an Army officer. A 2002 Marshall Scholar, she earned a Master of Science degree in Aerospace Engineering from the University of Bath, and a Master of Science in International Relations from the University of Bristol, graduating with distinction. Major McClain has an impressive and distinguished military career. She earned her wings as an OH-58D Kiowa Warrior scout/attack helicopter pilot, has over 2,000 flight hours in 20 different aircrafts, is a rated pilot and instructor pilot for the OH-58D Kiowa Warrior, and a rated pilot in the C-12 Huron (King Air), UH-60 Blackhawk, and UH-72 Lakota. Her special honors include a Bronze Star, Air Medal with Valor, two Army Commendation medals, Distinguished Honor Graduate of the Army’s Initial Entry Rotary Wing School, National Fastpitch Coaching Association All-American Scholar-Athlete, and part of the USA Rugby Women’s National Team – just to name a few. In 2013, Major McClain was selected as a member of the 21st NASA astronaut class and is scheduled to launch in November 2018 for a six-month mission to the Space Station. 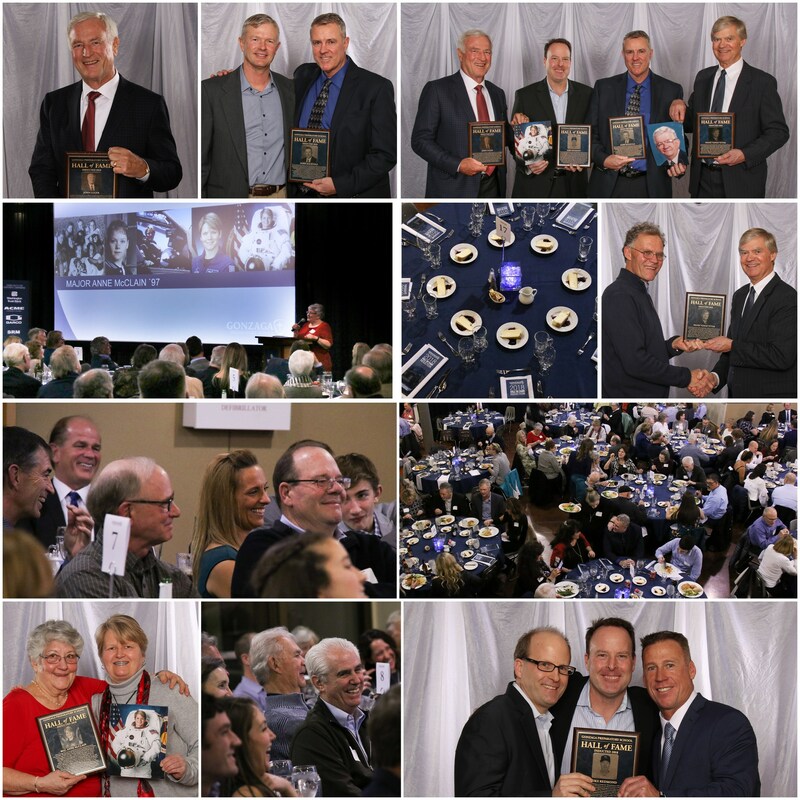 The purpose of the Gonzaga Preparatory School Hall of Fame is to serve as a means of maintaining the rich heritage and tradition of the Gonzaga Prep community. In addition, it will serve as a means of recognizing, preserving, and honoring the alumni, athletes, coaches, individuals, and teams that made significant contributions to the school and their community. Athlete/Team/Coach - who distinguished themselves while at Gonzaga Prep. Primary criteria should include athletic ability and contribution to his/her team. This may include individual honors and records, team honors or legacy of excellence for a determined period of time. Secondary criteria may include any post-Prep accomplishments, both collegiate and professional. Can only be eligible for selection 10 yrs after graduation. 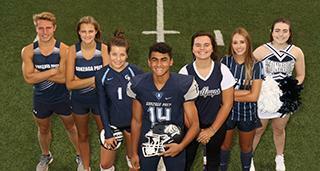 Alumni/Individual - who has made significant contributions to the Gonzaga Prep community, or in the case of alumni, have distinguished themselves in their field after graduation from Gonzaga Prep. Alumni can only be eligible for selection 10 yrs after graduation. Jesuit - who has made significant contributions to the Gonzaga Prep community, or in the case of an alumnae Jesuit, has distinguished themselves in the world. All nominees must exemplify the highest standards of sportsmanship, ethical conduct, and Ignatian character. Anyone (alumnus/alumnae, parent, current/former faculty/staff member, and/or friend of Prep) may submit a nomination.